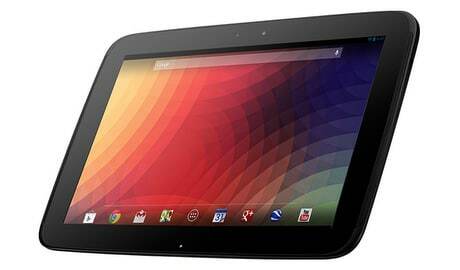 The Google Nexus 10 is a 10-inch tablet with a 2560 by 1600 (300ppi) screen and NFC. The device is approved for use with Google Wallet. The Nexus 10 features a dual-core ARM Cortex A15 CPU and a quad-core Mali T604 graphics processor, and runs Android 4.2 ‘Jelly Bean’. The Samsung-built tablet features what Google calls “dual side NFC”, meaning that NFC interactions can be triggered from both the front and the rear of the unit. The Nexus 10 is also known as the Samsung GT-P8110.